Whether you have a gaggle of kids at home, or in the classroom, you can instantly raise the level of fall fun with kid-friendly Halloween craft ideas. This time of year, even adults love to make DIY decorations and show off their creativity, hosting an extra-spooky Halloween bash they can completely call their own. Just up ahead check out great ideas for getting crafty at Halloween, along with a mixed bag of Halloween craft ideas around the Web. 1. Arrange the pasta on the paper before gluing to make sure you have the design you want. 2. Don't be afraid to improvise with different shapes of pasta. For example, a wagon wheel is perfect for the head, along with small tube pasta for the spine, and long spirals for the arm and leg bones. 3. Try bow tie pasta for the hips, or use two large shells. Small shells make great kneecaps, hands and feet. You can also break up thin strands of spaghetti to add fingers and toes. 4. Once you have all the pieces secured with glue, let dry and hang as a door or wall decoration. 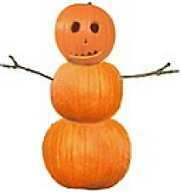 Just like Frosty the Snowman, Jack the Pumpkin makes for an eye-catching lawn or yard decoration. Jack's head can be either carved with a sharp knife or painted with a permanent marker. 2. Stick two barbecue skewers on the extra large pumpkin, then place the large pumpkin on top to secure it. 3. Repeat the process by placing two barbecue skewers to the top of the large pumpkin. then "crown" with the medium-size jack-o-lantern. 3. Add branches for arms -- or get really creative with small gourds for buttons and a hat and scarf to help deck the halls for Halloween. Light up the night at your next Halloween bash by re-purposing old mason jars to make these bright, colorful luminaries. 1. Wash jars in soapy water and let dry thoroughly. 2. Use brush and craft paint to coat the entire outsides of the jars in your favorite Halloween colors. 4. Add votive lights to the bottom of the jars. If using wax votive candles, light carefully using a barbecue or stove lighter. Just up ahead, discover more tips, advice, and illustrated instructions for making more fun Halloween craft projects, along with coloring pages and related group activities to create a memorable hands-on Halloween celebration. Halloween Art and Craft Lesson Plans and Activities - Milk jug jack o' lanterns, paper bag masks, pumpkin seed mosaics, Halloween ornaments, and lots more fun activities for kids of all ages.